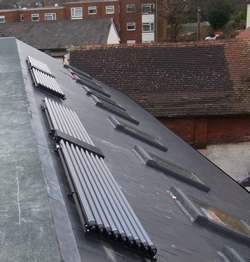 Our pitched roof mounting kits are designed with ease of installation and aesthetics in mind. Each kit includes roof mounting straps and bars, through roof flashing kit, the appropriate inter-collector manifold and a manifold cover. This provides you with everything required to mount and connect the desired number of LaZer2 collectors on a pitched roof. Once installed you will be left with a set of flow and return pipes inside the building. No external pipe work or roof fixings will be visible.